Following last season’s requirement that helmets be worn in the pit lane, plus a revised refuelling procedure to ensure safety, Eurosport Events and the FIM have made further changes to the technical and sporting regulations. As the 2018-2019 FIM EWC gets underway, here is an overview of the key modifications, to be rolled out starting this week at the Bol d’Or. Riders must set times at least 109% (compared to 110% previously) as fast as the fastest rider of their group in order to qualify. The regulations already specify a minimum qualifying time of 108% in the 2019-2020 season and 107% in 2020-2021. Eurosport Events has been striving to make the endurance world championship a more competitive event ever since its first season as FIM EWC promoter in 2015. From 115% in 2015, the minimum qualifying time will drop to 107% in 2020. Riders’ performance on the track in qualifying will determine the final grid. Teams will keep their grid positions even in case of a rider change between the end of qualifying and the start of the race. In addition to the bonus points currently awarded to the 10 teams leading the standings 8 hours and 16 hours into the race (12-hour and 24-hour races), a bonus ranging from 5 points to 1 point will be awarded to the first 5 teams on the starting grid. The points will be awarded whatever the results of the race. The tyre allocation rule for each race has changed. Tyres will now be marked with different stickers for use in qualifying and the race. In the Formula EWC class: 41 race stickers and 6 qualifying stickers per 24-hour race (45 stickers last season), 23 and 6 respectively for a 12-hour race (27 last season) and 16 and 6 respectively (or 16 and 4 if there are 2 riders) for an 8-hour race (20 last season). In the Superstock class: 23 and 6 stickers per 24-hour race (27 last season), 14 and 6 respectively for a 12-hour race (18 last season) and 9 and 6 respectively for an 8-hour race (13 last season). 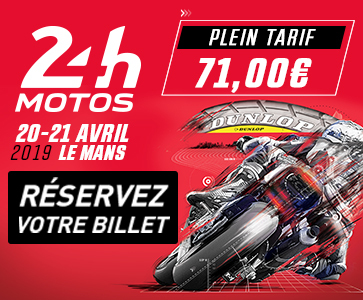 As the track at the Paul Ricard circuit has been modified and resurfaced, this particular change will apply from the 24 Heures Motos onwards. Teams are free to use as many tyres as they see fit at the 82nd Bol d’Or. Only persons wearing one of the 4 official armbands will be allowed to provide or receive tyres, spare parts or tools in the pit lane. When a rider stops at a pit lane box, only 4 people wearing a clearly identifiable official armband are allowed to work on the motorcycle. These 4 people cannot receive any external help. A new set of testing rules will go into effect for the Suzuka 8 Hours starting in 2019 in order to keep costs down and improve sporting equity. At the request of Eurosport Events and with the approval of the FIM, Mobilityland, the organizer of the Suzuka 8 Hours, has agreed to amend its supplementary regulations of the event. The prestige of a Suzuka 8 Hours win has increasingly led factories and factory-backed teams to invest in private tests, with a particularly intensive schedule in July in the run-up to the race. The lack of cap on the amount of testing allowed proved to be costly for teams and a significant constraint for riders competing in other FIM world championships who wish to compete for this legendary endurance race. Starting with the 2019 Suzuka 8 Hours, race organizer Mobilityland will schedule two official test sessions. The first session will be organized over a three-day period in early July, with care taken to avoid a date clash with the MotoGP and the FIM Superbike World Championship. The second official test session, for two additional days, will be held during the week of the Suzuka 8 Hours for all the teams competing in the race. In between these two official test sessions, no factory-backed team and no FIM EWC, MotoGP or FIM Superbike World Championship rider will be allowed to use the Suzuka circuit. For reasons of safety, Mobilityland reserves the right to grant exemptions to amateur teams with no connection to a factory and no factory-contracted riders. This rule will be added to supplementary regulation of the Suzuka 8 Hours. In case of infringement of the new rule, it will be up to the FIM’s international jury and the race direction to apply any penalty to the competitor. The sanction could potentially be as severe as exclusion from the race. Besides reducing costs for teams, the new framework for testing on the Suzuka circuit in July is aimed at improving sporting equity between main FIM EWC teams with Japanese teams competing solely in the 2019 Suzuka 8 Hours, the EWC Grand Finale.